If you like sitting outside enjoying the sun but find that there is no sun to be enjoyed, then why not take a trip to the brand new Sunny Player Casino instead. The casino offers games from Merkur Gaming, one of the smaller developers but one that offers a fresh showcase of products that many players will not have seen before. The site has an excellent selection of casino card and table games, such as roulette, craps, blackjack and baccarat. Of course there is also a good collection of slots and some of them are linked to progressive jackpots. Players will also find bingo games, casino poker and lottery games. 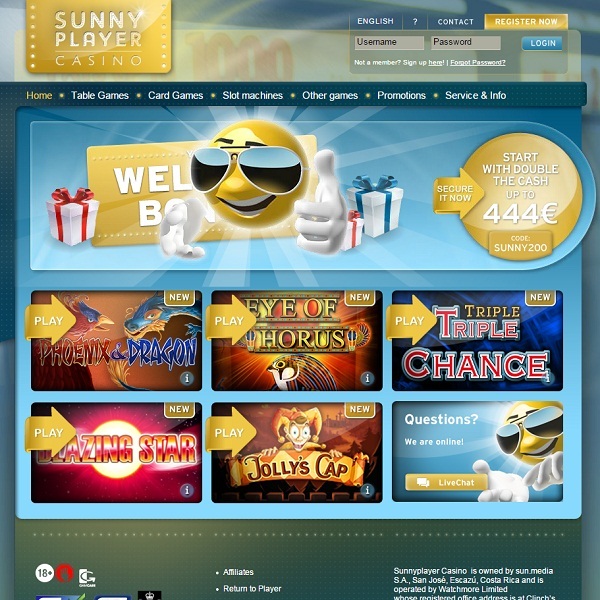 New members of Sunny Player Casino can choose between a free welcome bonus of €10 and a 100% first deposit bonus of up to €444. The casino also operates a loyalty scheme which offers players some fantastic rewards.